First, a note on methodology. In the favorability matrix from Pew, there are a few oddities. Perhaps the starkest is that Pakistanis find South Koreans as less favorable (by a hair–1 percent) than India, an unlikely reality. Part of the reason for results like this is due to how Pew processed survey responses from those respondents in the answering country that had “no opinion” about a particular target. 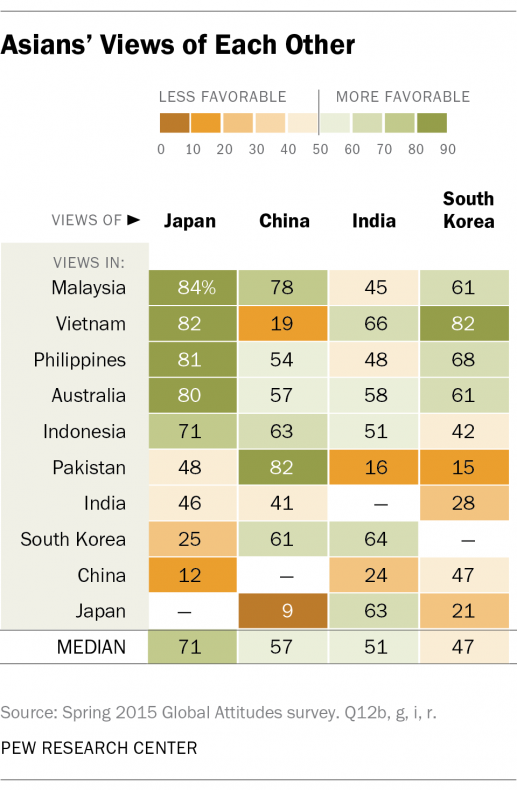 The more respondents state “no opinion”–as 65 percent of Pakistani and 52 percent of Indian respondents did for South Korea–the lower the favorability assessment. It’s well likely that many of these undecided South Asia respondents may ultimately view South Korea favorably, but that didn’t factor in here. Meanwhile, Pakistan’s favorability score for India is more telling since fewer Pakistanis would have “no opinion” about India. Japan’s positive showing attests to the country’s continued perception as a status quo power. Though public opinion tells us little about what causes Tokyo to be perceived positively across the region, it’s likely that Tokyo’s years of overseas investment and development assistance, combined with the recognition of Japan as a complex and prosperous economy, have led to positive views of Tokyo. That South Korea and China share strong and unfavorable views toward Japan also highlights the continued salience of Japan’s historical aggression during the Second World War. 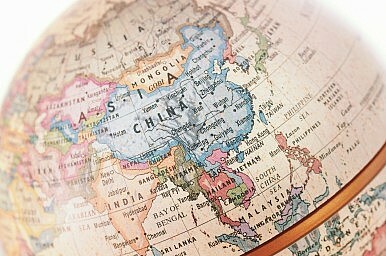 As seen in the matrix above, China’s perceptions across the region are also noteworthy. Japanese respondents viewed China less favorably than any other two-state pair. Even Vietnam, where the media has spent considerable time covering Chinese activities in the South China Sea, wasn’t quite as cool toward China. India, meanwhile, seems to have a mostly lukewarm reputation across the region, with most states seeing the country neither in starkly unfavorable nor favorable terms—Pakistan, of course, is the one exception. Bruce Stokes walks through the reports key findings in greater detail over at Pew’s website. Populism may be surging in the West, but it's a phenomenon across the Asia-Pacific as well.